Suzannah B. Troy artist: NYPD DOT Give Henry Buhl Ace illegal Planters the Opposite of Occupy Wall St. Treatment? 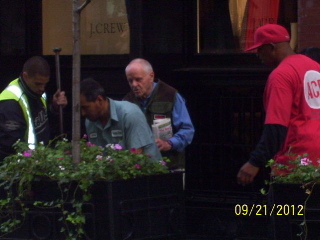 NYPD DOT Give Henry Buhl Ace illegal Planters the Opposite of Occupy Wall St. Treatment? Do the press with the exception of WPIX stay away from this issue and why. At the end of a 9 1/2 video you may hear answers you don't want to hear but the reality is these planters were illegally dropped by this man using ACE foundation as backdrop. (Note Sept 28: Video shows Mercer Hotel involvement - new posting on hotel coming soon) Dept of Transportation confirms they are illegal as does Community Board 2 yet the planters sit there.